Submitted by metricman on Mon, 03/23/2009 - 6:27pm. I have lived in the Williamsburg VA area since 1958, except for a year in Florida and a year in Hawaii. I have watched Williamsburg grow from a sleepy little tourist town to a major "Bedroom Community". Since the majority of secondary roads follow the "Lay of the land" (it is not flat here by any means), it is easy to get lost, and everybody has a different opinion about the best way to "get there from here". A GPS is a boon to visitors. The "Heart" of williamsburg has remained mostly the same. 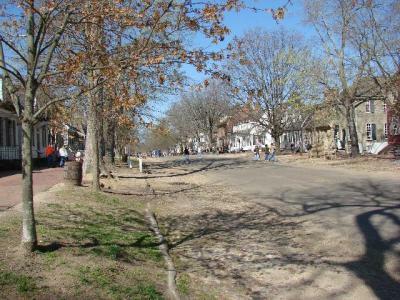 The "Restored Area", which is owned and run by the Colonial Williamsburg Foundation is in the Heart. The first set of files cover all the major buildings in the Restored Area, and since the streets are closed off to vehicle traffic, I have used l/l coordinates that will hopefully put you on the sidewalk at the front door of the building listed. You can not drive in the "Restored Area between 8 AM to 10 PM. Wear some good walking shoes - I did. There is a Bus Shuttle that stops at specific places on the perimeter of the Restored Area and you must have an Admission Ticket to ride it. You don't need a Ticket to just enjoy the scenery (except for the Revolutionary City section when it's active in the afternoons), but to get the most from your visit, you should start at the Information Center. Please remember that "Ticket Sales" help Colonial Williamsburg Foundation maintain and improve the restored area. Please visit http://www.history.org for lots of info on what's available and when, as some sites are seasonal. The flower gardens in restored area are fantastic, especially in the spring. To see the area that I have compiled so far, please visit http://www.history.org/Almanack/TourTheTown/index.cfm for info on the new app to use on your cellphone. There will eventually be a series of files listing all the restaurants, banks and ATMs, major Dept. stores, other attractions in the area, etc. and they probably will not be small files. 03/29/09 Added missing Saddlemaker shop. 04/05/09 Entrance to Magazine moved back to former location by CW. 04/18/09 Deleted Cold Drinks entries from non-exibition buildings. Added missed water fountain to "Refreshments" and "All_CW" files. 04/22/09 Moved Basset Hall from Exibition Buildings to Museums. 10/25/09 Corrected error on line 32. 10/25/09 Added CW parking lots. 12/26/11 Corrected link to "Tour The Town". 01/04/14 Corrected Blacksmith's shop location.